About: We will continue (from the September 20 workshop) the discussion on “Supporting Independence in the Elementary Child” by sharing experiences. What is going well, what is not? Independence doesn’t happen overnight, so this is an opportunity for you to discuss strategies for building independence beyond the classroom. You are welcome to bring your lunch if you wish. 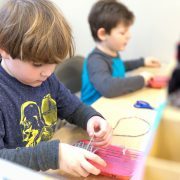 About: We will Follow up on January 17th’s evening workshop about “Montessori in the 21st Century” – the focus is on elementary, but all are welcome! You may bring your lunch if you wish. More details: This session will be accessible the day of via Zoom and will also be recorded. Please feel free to bring a lunch! Questions? Email Director of Parenting Support Angie Ma.